The countertop is a significant component of a kitchen. ideally, it is the place where all the cooking action takes place. Moreover, a countertop is the basis of kitchen décor whenever renovating a kitchen. It plays the role of setting the tone and a feeling of the space. Based on countertops importance to kitchen décor, it matters a lot what design, material, and finish chosen. We have combined the hottest 2018 quartz countertop trends that will shade light towards giving your kitchen a spectacular view. As per your expectations, these trends heavily focus on material and color choices. The introduction of Quartz paused as a quality classy alternative to the dominant granite. Granite is a natural rock that has dominated the countertop scene for years, especially for homeowners who value durability, material strength, and spectacular views. Although it has a downside by being porous- meaning that water, wine, and oils among other liquids seeps through the surface leading to staining. Even worse, granite promotes the breeding of dangerous bacteria making your counter-top unsanitary. But quartz is non-porous hence does not require any and or regular re-sealing. Ideally, it has a high resistance to staining, therefore, being one of the most hygienic countertop options for consumers. Besides, it is firm which makes it a super durable material with low maintenance cost and the best choice for end users. Quartz is now present in patterns, finishing techniques and colors that mimic natural stones. However, more manufacturing improvements are expected in 2018 to continue making these countertops dominate the markets. Since there have been designs using textured surfaces, why not integrate it in countertops too. 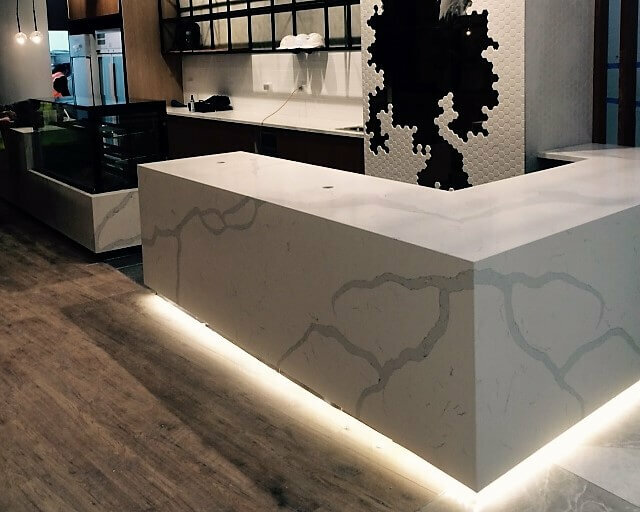 Some of the most common surfaces including leather , honed can be used in other different materials, such as marble and quartz. With little to no shine, honed surfaces give a matte finish. However, the appearance will vary according to the stone used, but it should have a smooth feel with a low sheen. The leather finish in a more recent treatment style that has gained popularity in the past years. It bears a soft sheen, less glossy compared to a polished slab with a different feel to the touch. Veining and Patterns present countertops with character gets popular. Homeowners are nowadays seeking for a bit more character in countertops. Thanks to technology, creative solutions are available to meet these demands. Unlike in the past whereby countertops came in plain styles, today they are available in a wide variety of patterns. Bid goodbye to the round countertops particulates and welcome realistic veining. It is possible for materials like quartz to be designed to resemble natural stones slabs such as marble and granite. It involves developing veins in unusual patterns then swirled into the tiles, therefore, boosting your creative personality in the kitchen. With countertops are getting a modern treatment, sinks are not left behind either. The favorite view for most homeowners is a sleek, continuous style stretching from the countertop then down into the drain. The integrated calacatta sinks and countertops have become other favorite trends in 2018. Both the integrated calacatta sinks and countertops are made of the same materials making them blend seamlessly, therefore, providing a smooth flow from the working surface to the drain. The absence of breaks allows proper and smooth wipe from the work area down the sink leaving no dirt traces. The integrated kitchen calacatta sinks are compatible with any kitchen style. They fit perfectly in a modern home and wonderfully complements more traditional elements in a farmhouse or country kitchen. The Neutral Tones as Bright colors are falling out of favor. Soft neutral tones are a preferred common theme running across homes in upcoming decor trends. 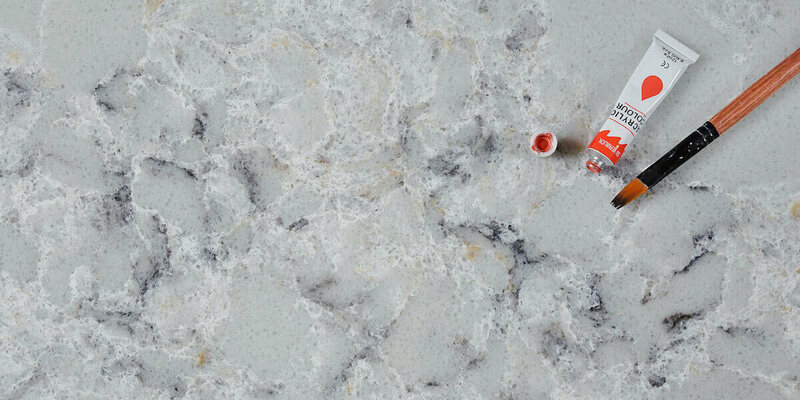 The bright, bold colors of Art Deco and mid-century styles are gradually losing value in the kitchen, contrary to the more laid back tones made of Calacatta. Instead of a jet black or bright blue countertop, white, beige, and soft grey tones are popular in most 2018 kitchens. Interestingly, this neutral tones vice comes at a time when kitchens are embracing natural lighting. Folding glass doors, skylights, and super large windows are gaining popularity in kitchens. This has resulted in airy feel and an enhanced brightness shouting modern. Quartz Back-splash tiles are becoming the new back-splash. Homeowners typically used a 4” high slabs of counter-tops materials on their walls with tiles or paint above. Nowadays, these designs are dying out paving the way for decorative tiles only. The backlash tiles are expected to remain the most attractive choice for a homeowner would make in the year 2018. In conclusion, the counter-top has always played a significant role in the kitchen decor. However, we have experienced shifts as homeowners’ tastes in designs for a perfect cooking space keeps on changing. However, in 2018, the modern kitchen features neutral colored counter-tops with sleek integrated Quartz kitchen sinks and delicate slabs. This entry was posted in Quartz Countertops and tagged calacatta white quartz stone, cheap quartz countertops.